There have probably been more films about Vincent van Gogh than any other artist, from the Kirk Douglas-starrer Lust for Life in 1956, to last year's animated Loving Vincent. But, rather than feeling like overkill, Julian Schnabel may well have made the definitive film about the troubled genius. 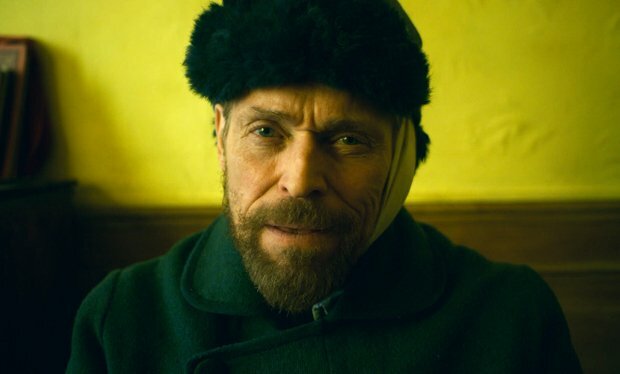 Featuring yet another supremely committed performance by Willem Dafoe, whose ravaged visage has never been more apt, this is a deeply empathetic portrait of a man who only found peace when at his easel, capturing the nature he loved. While the plot beats are familiar – the poverty and mental illness, the self-mutilation, the relationships with his protective brother Theo (Rupert Friend) and fellow artist Gauguin (Oscar Isaac), the lack of success in his own lifetime – the film has a singular beauty and intensity, along with a keen intelligence about the art that isn't surprising given that the director is, himself, a painter. The focus is on Van Gogh's time in Arles, in the south of France, where he decamped from Paris at Gauguin's suggestion, with the desire to 'find a new light, for paintings we haven't yet seen.' If only the locals were as keen as he to become friends. Long sequences portray him in a form of rapture as he discovers the landscape. Cinematographer Benoît Delhomme (The Theory of Everything) uses lots of handheld as he follows Dafoe or suggests Vincent's point of view; with the palette of the film evoking Van Gogh's own, it's every bit as ravishing as you'd expect. Whether in ecstasy or despair, or simply at work, Dafoe employs the same easy naturalism that was so effective in The Florida Project (both performances were Oscar-nominated). His Vincent can be touchingly sweet, achingly vulnerable and a bit scary; he's most enjoyable when his lucid grasp of theology confounds a priest (Mads Mikkelsen) who's trying to test his sanity. Mikkelsen, in particular, enjoys one of Schnabel's signature tropes (perfected in The Diving Bell and the Butterfly) of the actors talking directly into the close-up; Isaac oozes charismatic egotism; and composer Tatiana Lisovkaia's insistent score echoes the passion and turmoil inside Vincent's head. Selected release from Fri 29 Mar. Vincent Van Gogh (Dafoe) discovers the landscape of Arles and meets the locals. Dafoe gives a supremely committed performance, by turns touchingly sweet, achingly vulnerable and a bit scary, and Delhomme’s cinematography is ravishing; possibly one of the definitive films about this troubled genius.